UPDATE: GIVEAWAY CLOSED. CONGRATULATIONS DANIELLE! In a lot of ways Charlotte is just like me. She doesn’t like scrambled eggs, or tuna fish. She really likes a good book, but prefers magazines because of all the glossy pictures. Pink is her favorite color, and she loves peanut butter chocolate chip cookies. Loves them. Oh, and she loves a good giveaway. 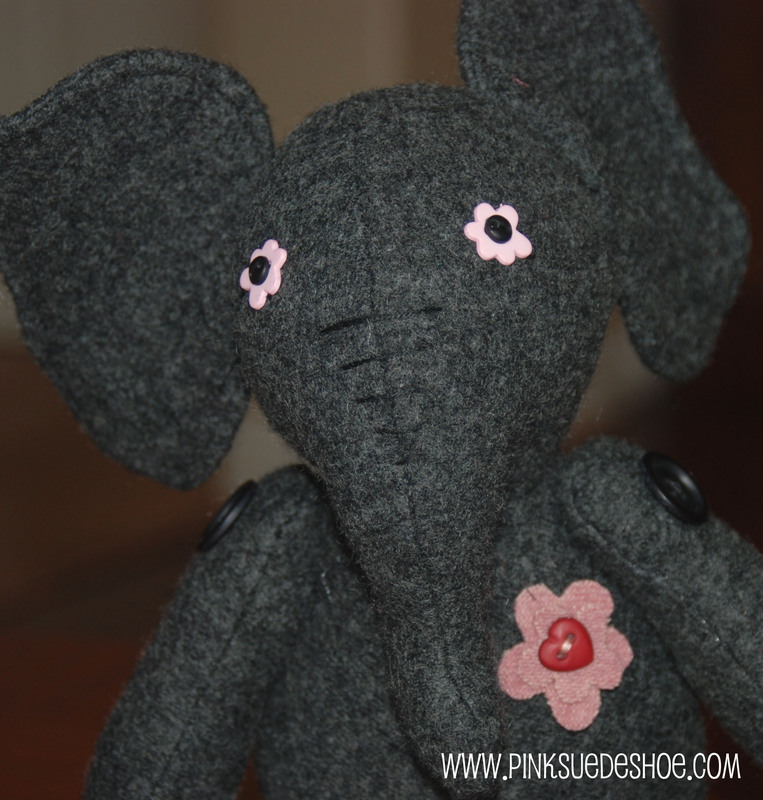 Charlotte is made from a thrifted felted cardigan. 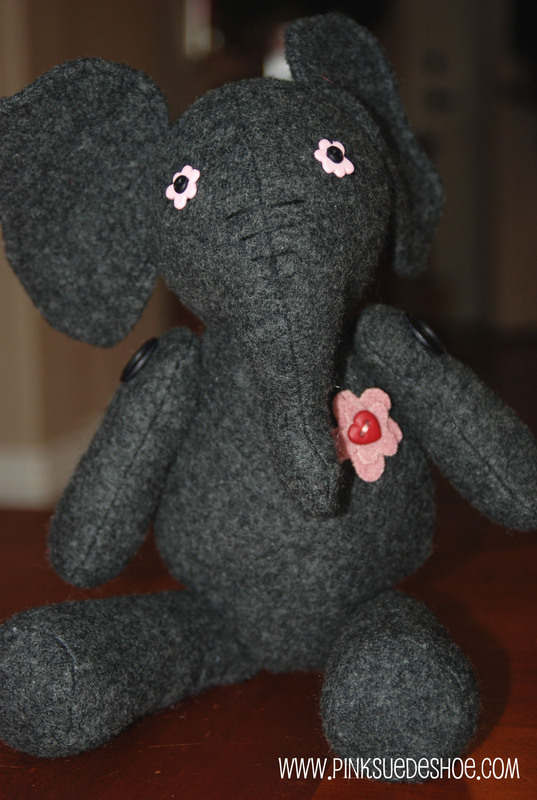 She is all wool, stuffed with polyfill and has cute little button eyes and moveable button joints. She has a big heart (made from a small button). She is always up for a new adventure. And since she asked so nice, and is so dang cute, I told her she could have one. I am going to give her away and she is going to come and live with one of you. Leave a comment before Sunday (Happy Heart Day) telling her about your favorite adventure. It can be something you have already done, or a new one you would love to have. Charlotte likes to hear about all kinds. Next Monday I will post the winner. Charlotte is excited to start her new adventure with you. I know she would love to hear all about your adventures and your secrets. She’s really good at keeping secrets. Happy Adventuring! Charlotte stands 15 inches tall toes to tips of ears. She is held together with button joints and has button features, so please don’t put her in the hands of small tiny persons. But she’ll happily watch them play from a high shelf. You can find the pattern to make Charlotte here. Hi there Charlotte. I am sure you would like to adventure your way here to Sydney (Australia). One of my favourite adventures is when I built a raft with my friends and lots of pop rivets. We then competed against other teams on a big river. Our raft was far from the fastest but boy did we have lots of fun racing it. It was much easier taking it home as all those pop rivets did not keep it together. My favorite (ongoing) adventure is my life with three kids and a wonderful husband. Every day is an adventure when you take the time to see it through the eyes of your children! Greatest adventure: graduate school, internship, work, and pregnancy all at the same time. Hi Charlotte, I am not sure you would classify this as a “great adventure”, but it is probably the best story I have to tell and was an adventure in some aspects. When I was a sophomore in high school, I was asked out by a Senior boy whom I had a pretty big crush on and am pretty sure he liked me too, well obviously he did enough to ask me out. The sad thing was he was leaving to serve a mission for his church the following Wednesday, and we were going out on Saturday. We doubled with one of my best friends and a friend of his. The date started with dinner at Tucci’s. My date ordered mozzarella sticks??? I thought that was odd so I asked him why? He told me he had eaten some of the native food from the place he would be serving a mission (sad to say I can’t even remember where he went) and wasn’t feeling very good. We all just stared back at him and knew what he was saying. “Ok, let’s go.” I said walking for the head of the trail leading back down. I didn’t want to ask questions so we headed down. When we got to the bottom we waited and waited. After 45 minutes I was worried he had fallen off the mountain or something. Just before we were about to go look for him, we see his head bobbing down the trail. When he turned the corner I couldn’t believe what I saw, he was wearing his jacket! Not odd you say, well what if I said he was wearing his jacket like a skirt and had his belt in his hands. Wrapped up at the end of the belt were his pants, and he had one sock missing. “I didn’t make it,” Was all he could say. My jaw dropped, are you kidding me, my date just shat his pants. My friend and her date busted out laughing and I just stood there, not knowing what to say or do. Oh and it doesn’t end there when we were driving home, my friends date had his head out the window to avoid the smell and hit the car in front of him, awesome. Luckily it was just a fender bender and he gave him $20 bucks and we were on our way. Needless to say there was no doorstep and pretty much no communication after that. So that is my crazy adventure. I hope I win, but if not I hope you at least had a good laugh. oh she is just darling. i’d love to have her keep an eye on my little house, of course from a high shelf!! Charlotte and I have a lot in common, especially our taste in cookies and the color pink. My greatest adventure? I don’t know if the “greatest” has happened yet, because I believe in true love and I think that adventure will have to wait for now. But I’ve been all sorts of places–watching whales in Cape Cod, sleeping on a boat in Friday Harbor, WA, walking through Chincoteague. The world is beautiful and so full of adventure…we only need to open our eyes. Oh, my e-mail address is artsyrockerchick@aim.com!!! She is so cute! I love the little button eyes! I love that little elephant! So cute! I’m trying to think of an adventure that’s also not “my most embarrassing moment”…. I spent a week in Paris visiting a mission companion. She had a full time job so I was left alone to wander the city by myself. It was bliss. I would do it again in a heartbeat! my favorite adventure was my backpacking/hosteling trip over ten years ago now to England and Scotland and Wales. My friend and i had so much fun and i learned a lot about being on my own and just having fun. it was so fun to see and be in a new culture. I would love having him in our home. So here goes. All of this is true. My best adventure was moving to Las Vegas. A friend of ours saw Las Vegas as a growing city on the cover of National Geographic. He decided he needed an adventure, packed up his car and ended up teaching science here in the school district. When I told my husband he said, “That’s crazy. Why would anyone want to move to Las Vegas?? !” We were trying to buy a home and were having problems finding anything that wasn’t an extreme house makeover. I was very glad we weren’t successful. 6 months later on New Years (1998), while listening to Prince’s 1999, and watching a hotel building implode on the Las Vegas strip on tv, we love a good party out here, we made a resolution to move to Las Vegas. We kept it. We put up a yard sale in June with a sign that said “Vegas or Bust”. Most of the people thought we were joking. We got a lot of people to travel that long country road to our apartment! We closed our bank account. For some reason my husband knew the guy next to us in the waiting room from high school. We said we were going to Las Vegas. He said, “Ohh!” When we corrected him that we were moving to Vegas, he said, “She can make good tips in the casinos.” I really didn’t know what to say then. We left Maine at the end of that month with another couple. A few crazy things happened along the way. We drove our moving van through Boston and got irritated that a kid on a bike was blocking the car lane on the right. We stopped for some Chinese and drove back under the same bridge. The clearance was higher in the center and if we had been in that right hand lane we would have smashed our truck and all our worldly possessions. In Missouri, we narrowly missed hitting a van that came too fast from the on-ramp, passed all lanes and smashed a few car lengths into the center median. When our moving van started to overheat in the west, no air conditioning either, we had to travel by night in New Mexico. We stopped at Tucumcari and drove the rest of the way to Las Vegas. I remember thinking the morning sky was beautiful. We had no air conditioning, so imagine 117 degree heat while stuck in traffic over the Hoover Dam! At the same time, we were hoping the truck wouldn’t overheat and stall! At one point I think I passed out from the heat and exhaustion. We kept pouring bottled water over our friends cat and he didn’t complain one bit. Getting to the apartment complex at 4 in the afternoon, the hottest part of the day, we collapsed on the bare floor. 3,000 miles later, did we make the right decision? Yes, yes, yes! All of us ended up with jobs that paid more (in teaching). No bad weather except for the heat for a couple months, and we had a our first brand new home within 6 months of moving here. Three kids later we still are here and we still love it. Our adventure called life still continues. Even if i don’t win, I really enjoyed recalling that and hope you liked reading it. Hey Charlotte! Aren’t you a cutie. Big adventure… My first alone trip with just my baby and me. It wasn’t exciting at all. But it was fun to be in California just the toddler and me! Charlotte is SO cute! For me, every day is an adventure! I love waking up in the morning, pausing a minute before jumping out of bed, thinking about what might happen that day. Today was a busy day. Laundry, kids to school, driving hubby to work, dentist, Target, bank, home for lunch and potty break, change laundry, Post Office, oil changed in car, Barnes and Noble, JoAnn’s, wedding gifts sent, folding clothes, Valentine’s done, call pest control, still folding clothes, follow up emails, texting kids–yes, you can go on the date, no I can’t do your laundry, talking on the phone to daughter #1, you’re going out with him again? and on and on and on … and it’s not even 3:00 yet. I would love to have that cutie on top of Sarah’s dresser. Once upon a time while I was 34 weeks pregnant, our house had a propane expolosion with my husband and I inside….needless to say we made it out alive! Hello! Thank you for stopping by my blog and leaving the kind kind comment on my Marabella quilt. Charlotte is an absolute darling. You did a marvelous job! I love Charlotte. I am not sure what adventures Charlotte would experience with me– mostly just hanging out in my studio and helping me select fabrics for quilts or cheering me on as I seam rip, which I tend to do quite often. Either way, I’d love to have her join me in Texas. We don’t have man elephants here. oops… that was supposed to be manY… not man. I realize I don’t have a child to give this to (yet) but I have always had a love for elephants so I’m hoping I get this one. Most of my adventures aren’t planned, just pure spontaneity. I purchased tickets on a whim to go to Cambodia with my husband in April so that’s an adventure I’m looking forward to right now. Oh, my Erika! She is adorable!! You have some major talent! My greatest adventure was going on a service trip to the Galapagos Islands in 2004 with my husband. The Ecuadorian government offered their cargo navy ship to us. We loaded the boat…ready for a 6 hour expedition to the island of Isabella, when a storm hit. (Mind you, on a cargo ship, there are no sides to the boat. It is basically a drop off into the deep, stormy ocean with only a little rope saving you from falling.) The boat became really, really slippery. We were all sitting on the deck because the sailors inside were a tad…creepy. We were sliding all around, throwing up, holding on to the road for dear life. I ended up wandering inside because I was freezing and saw the sailors watching us pansy Americans from the window laughing. It was quite the adventure. And then, we shared the tiny island for 2 weeks with seals, iguanas, blue-footed boobies and enormous tortoises. And the food…it was an adventure all its own.